Anyway, I just couldn’t decide what to eat today. My brain was crammed of odd things and chores I haven’t done yet. I need good food, not junk. 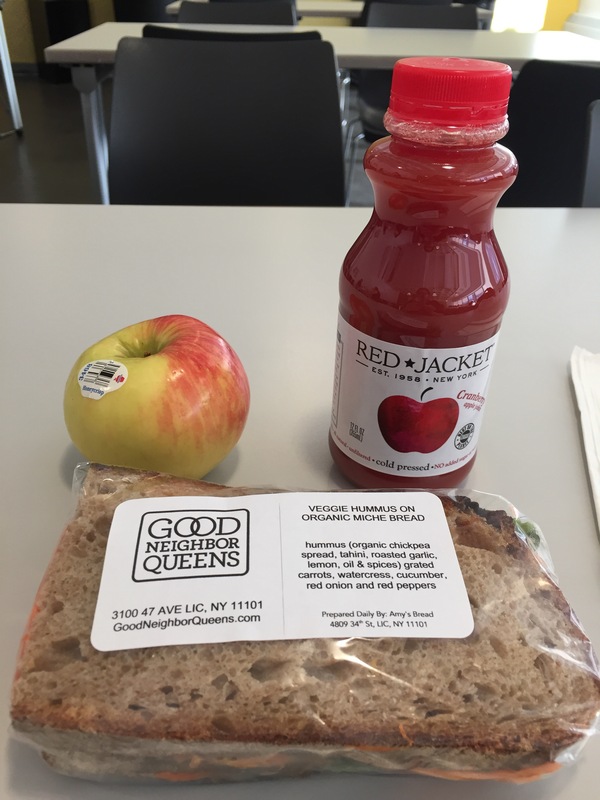 Good Neighbor Queens is crammed with good things to eat, all locally made in New York State, mostly organic and fresh. And its workers at the store are warm are gregarious. For the main event, I ate a veggie hummus sandwich on organic Miche bread, which also included grated carrots, watercress, cucumber, red onion and red peppers, prepared daily by Amy’s Bread on 34th St. in Long Island City. It’s definitely good enough, even great. 🙂 The juice (no added sugar or water) was wonderful; the sandwich was full of good veggies layered on a hummus subtly flavored with garlic and lemon juice. I always hope that by eating food that’s rich in nutrients, and has been grown, made and processed well, would cure any kind of mental cloudiness or malaise. “An apple a day keeps the doctor away,” the old adage goes. If that’s true, I hope the hummus and the apples will help turn this day around for me. Happy Monday.